This is a very belated review of a book that has been in my reading pile since December 09. But I’m glad I found the time. Published by the folks at marketing automation software company Genius.com, and authored by respected consultant, author, and blogger Ardath Albee, this is a valuable primer that would serve as a useful resource to anyone just getting started with a marketing automation system. The book is available via free download (registration required) on the Genius.com site. First: a quibble. I’m of the school that believes that “marketing automation” is the technology, and “lead management” (or “lead nurturing” – take your pick) is the application of that technology. This is a book about lead nurturing – the inside cover even says as much – so the title is a misnomer. In fact, the title doesn’t really do the content justice, because anyone looking here for guidance on marketing automation technology will likely be disappointed. In my experience, lead scoring can very often be over thought. By that I mean that companies, even with the right technologies in hand, often delay setting up a lead scoring protocol, sometimes indefinitely, because it seems just too complicated to evaluate how to score, in absolute and relative terms, every possible action that a potential customer could take. In reality, lead scoring is highly dynamic. Even with the best possible planning and evaluation (techniques for which are outlined in this book), most companies find that criteria they were convinced were all-important to salespeople are in fact not, and other criteria they all but ignored are in fact critical. In “The Essential Marketing Automation Handbook,” Albee provides a series of charts with suggested guidelines for how to score specific demographic (e.g. company size, job title) and behavioral (e.g. email response, event registration) criteria. Taken together, these charts provide very useful guidelines for a setting up a lead scoring system, albeit one that should be tailored for a company’s unique sales infrastructure and process. Frankly, you could do far worse than to simply take these recommendations verbatim, and simply adjust the scoring over time based on what you learn once the system is live. In other words, it’s the rare company – if there even is one – whose prospects all march through the selling cycle in a predictable manner. In the context of lead nurturing, that means pretending you can serve up content in a specific, pre-determined sequence and expect prospects to be carried along on a tide of education, qualification, validation, etc. is probably wishful thinking. As with lead scoring, companies embarking on a lead nurturing program should be prepared to evaluate – and optimize – their content strategy on time: swapping in new content as it becomes available, and swapping out content when response rates suggest it has become tired or outdated or simply inappropriate for that stage in the program. 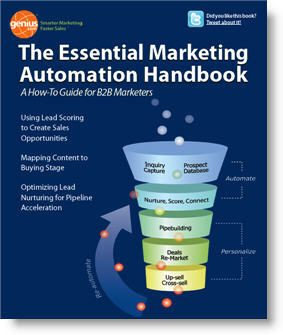 “Marketing Automation Essentials” is also valuable reading to anyone looking either for a business case for lead nurturing, or for techniques to prove the business value of an investment in marketing automation. Albee outlines clear steps for measuring lead nurturing effectiveness, based on criteria ranging from pipeline momentum, to increased sales opportunities, to what she describes as “lead engagement.” As with the entire book, everything is explained in compelling language that neither patronizes the reader nor assumes too great a level of sophistication. Finally, Albee spends the entire last chapter discussing the process of optimization – how to change and adapt your strategy over time based on results. In my view, this is the most valuable section of the book, simply because it recognizes what many so-called primers on this topic seem to forget: that lead nurturing is an ongoing, repeatable process: one ripe with opportunity for testing, experimentation, and learning. In all, this is a useful text for both lead nurturing newbies and sophisticated marketers. And you can’t beat the price. This entry was posted in B2B Marketing, Lead Management, Lead Nurturing, Marketing Automation and tagged Ardath Albee, b2b demand generation, b2b lead generation, B2B Marketing, Content marketing, Demand Generation, genius.com, Lead Management, Lead Nurturing, Marketing Automation on March 26, 2010 by Howard Sewell. Thank you very much for your review. I’m very happy to hear you think it offers value. I completely agree with you. The book offers a clear and overall picture about lead scoring and lead nurturing and it includes many helpful examples. I recommend it!